Tutubi often pass by Malabon Zoo when he visits his brother living in barangay Acacia but he's never really been inside the famous private zoo owned by Manny Tongco. 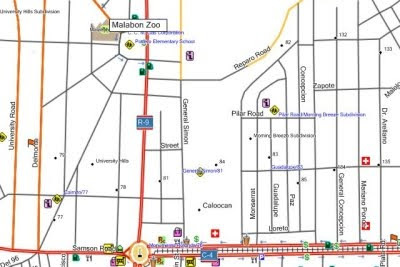 This post is for the information of people wishing to go to Malabon Zoo which is near Monumento area of Caloocan. Commute to Malabon Zoo from Makati or anywhere on EDSA is very easy (but slow) just by boarding buses with signboard UE/Letre. Those buses pass right in front of Malabon Zoo. Fastest way is to take MRT, get off at North Avenue station then board the UE/Letre bus. From LRT Monumento, you can walk towards Manila Central University (MCU, near Rosendo Simon St.) then board the UE/Letre/Navotas bus or just ride the jeepneys with Malabon Acacia signboards. To get back, you need to walk towards Potrero Elementary School on MacArthur Highway to board a bus to Makati/MRT/LRT. You can also walk towards del Monte to board jeepneys going to LRT/Monumento then take a bus or LRT from there. From Makati, take EDSA all the way to Monumento by to exit to MacArthur Highway, left to Pinagtipunan Circle (landmark: Potrero Elementary School) then left to Gov. Pascual Avenue where Malabon Zoo entrance gate can be found very near the corner to your left. Parking is just on the street. Call Malabon Zoo contact number for inquiries, entrance fees, kiddie parties, events, group tours et al. Thank you advertising our blog post about Malabon. You know I am not good at giving directions. I am sure this will be very helpful to those who want to visit Malabon Zoo. Thanks for the information. We will be there on April 29, my birthday. nice post.. thanks for the info.. yung entrance fee po ba for kids and adult na rin? kris, yes, adults and children. going there christmas day or new years day?